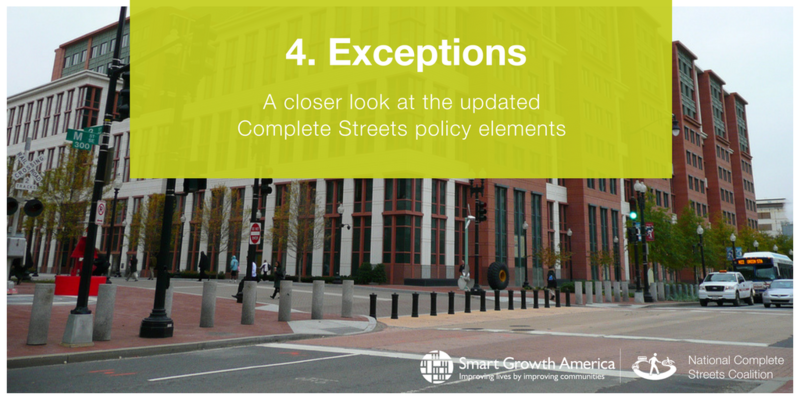 This post is part of Complete Streets month at Smart Growth America; we will be sharing a series of blog posts that cover and explain each of the 10 revised policy elements in some detail. Complete Streets policies should be comprehensive and apply to all streets in a community, but in certain circumstances, exceptions can be made. The Coalition believes a specific set of exceptions are appropriate with limited potential to weaken the intention of the policy. Clear, accountable exceptions ensures that Complete Streets policies do not have loopholes that could hinder implementation. If the policy allows for gaps then those responsible for interpreting the policy may be less likely to follow it and accommodate the needs of all people who use the road. Accommodation is not necessary on corridors where specific users are prohibited, such as interstate freeways or pedestrian malls. Exclusion of certain users on particular corridors should not exempt projects from accommodating other permitted users. Cost of accommodation is excessively disproportionate to the need or probable use. A documented absence of current and future need. Emergency repairs such as a water main leak that requires immediate, rapid response; however, temporary accommodations for all modes should still be made. Depending on severity of the repairs, opportunities to improve multimodal access should still be considered where possible. In addition to defining exceptions through strong policy language, there must be a clear process for granting them, preferably with approval from senior management. Establishing this within a policy provides clarity to staff charged with implementing the policy and improves transparency and accountability to other agencies and residents. To raise the bar, the revised policy element now requires that the exception process must also be transparent by providing public notice with opportunity for comment and clear, supportive documentation justifying the exception. “Predicting future use of roadways requires a level of knowledge of local development planning and decision-making. Talking to the community and stakeholders is one way to gain this expertise. An engineer designing the road is unlikely to have all the information about how a roadway is used today or what the plans are for the future if they do not talk to the stakeholders,” said Beth Osborne, Senior Policy Advisor at Smart Growth America and Vice President of Technical Assistance at Transportation for America. “Commitment in all projects and phases” is just one of 10 policy elements that will be featured this month. We’ve officially revised our policy grading rubric, known as the 10 Elements of a Complete Streets Policy. The Complete Streets movement has evolved since it began in 2004 to focus far more on implementation and equity, but the framework for grading the quality of policies hasn’t kept pace. For months, a group of national stakeholders, consisting of engineers, planners, researchers, and advocates, worked to revise the policy elements and truly raise the bar for what Complete Streets look like in practice. The entire revised framework will be available on our website on November 30, 2017. If you have any questions about the changes to the Complete Streets policy framework, please contact us! We’re happy to discuss further.